National Waffle day is coming up on March 25 and what better way to celebrate then with Mickey Mouse shaped waffles? If you have a traditional shaped waffler, it will work, but there is just something magical about a Mickey Shaped Waffle – especially smothered in an amazing bananas foster sauce! Christmas is over. The kids passports have just arrived. It is time to start planning my Disneyland surprise! So far we have managed to keep it quiet from the kids and I am hoping to surprise them with the news just a few days before we leave. There were some questions when we had to order passports, but my 4 year old doesn’t actually know that anything has been booked and confirmed. When I saw this new Little People Magic of Disney Day at Disney set by Fisher Price I instantly knew it had to be part of my Disneyland surprise. We love Little People in our house and this set couldn’t be more perfect for the Disney lover in me. It even has a fireworks show and music! At 2 and 4 I think my kids are still a bit young to read a t-shirt or understand a packed suitcase, but I know new toys are something they can get excited about. I have also bought the Little People Lil’ Movers Airplane and my hope is to make it into a bit of a scavenger hunt in the house where they first find the plane and then need to follow the clues to fly their Little People to the Disneyland set. I am hoping this action will help them make the connection that we will be flying to Disneyland. I haven’t worked the plan all out, but there will be balloons and other mickey themed decorations involved, and I will likely break out the Mickey waffle maker afterwards! We will also watch the Disney Vacation Planning DVD so we all have a better idea of what to expect in the parks. I think I am more excited about planning this then I was for Christmas. Have you ever surprised your kids with a Disney vacation? How did you break the news? This year we have decided to keep our Christmas pretty scaled down in terms of decorating. After last Christmas, we nicely boxed up all our ornaments and Christmas décor thinking we would be moved into our new house by this point. We are still a good two months away from being in our new home, but we have made the decision not to pull out all the Christmas decorations and then have to box it back up when we’ll have enough other packing and organizing to do right after Christmas. I was originally disappointed by not being in our new home for Christmas and not getting a real tree like we normally do, but it has proved to be a bit of a fun challenge for me to come up with alternative cheap and simple solutions to decorate the house. We have a 4 foot artificial tree I bought several years ago and we will be using that as our tree. 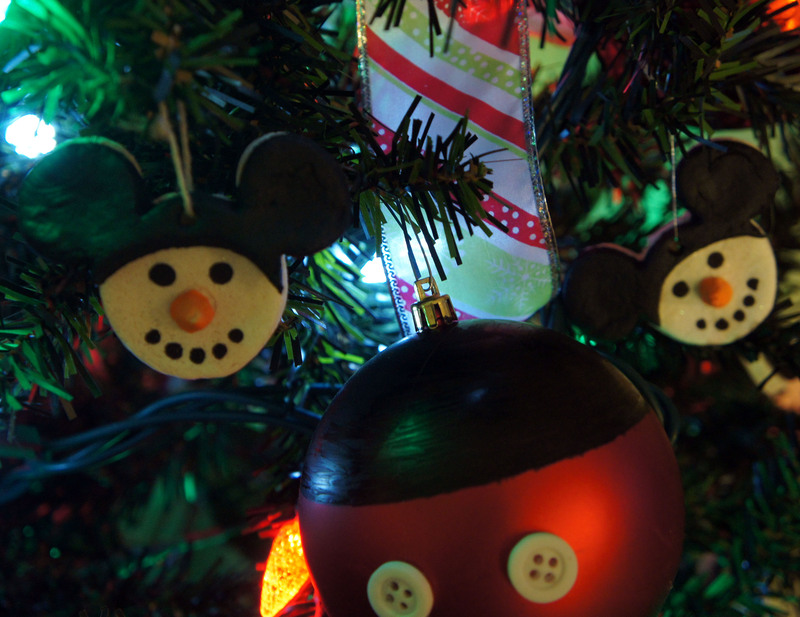 I decided to make some quick Mickey shaped ornaments for it out of Christmas balls, and then things kind of snowballed from there with Mickey themed DIY projects throughout our main floor. This week I will be sharing with you what I have been up to and highlight a different Mickey themed Christmas project each day. Today we have some relatively simple salt dough ornaments I created to hang on the tree alongside the large Mickey Balls. 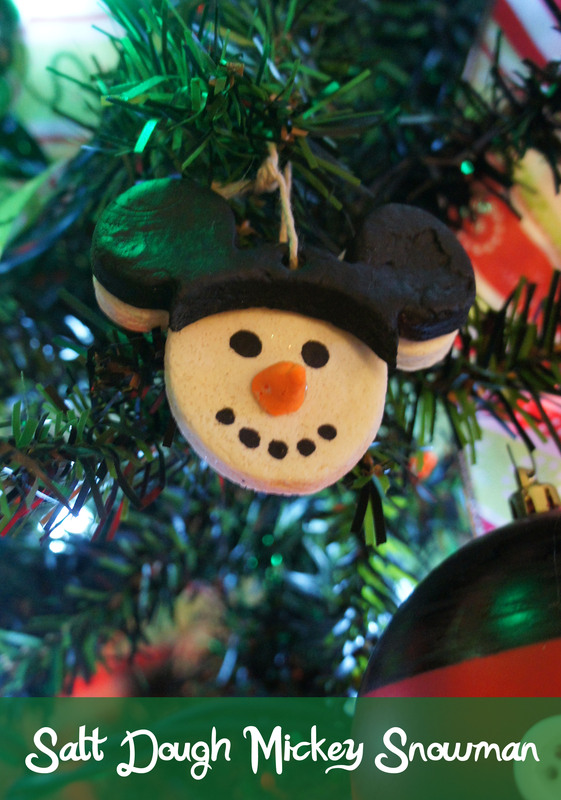 In my search for ornaments inspiration I came across these adorable Mickey snowman ornaments from busykidshappymom and thought they something simple I could recreate in salt dough. I remembered I had bought a Mickey shaped cookie cutter about a year and a half ago with the intention of eventually doing a Mickey or Minnie themed birthday party for one of the kids. I have all kinds of Mickey party ideas pinned on pinterest, but there are just so many other fun themes to pick from that now I am not sure I will actually ever end up doing a Mickey or Minnie birthday party. I wasn’t originally planning an entire Mickey/Minnie themed Christmas, but it worked out nicely due to our circumstances and has been a good excuse to put some of those pinned ideas to use. 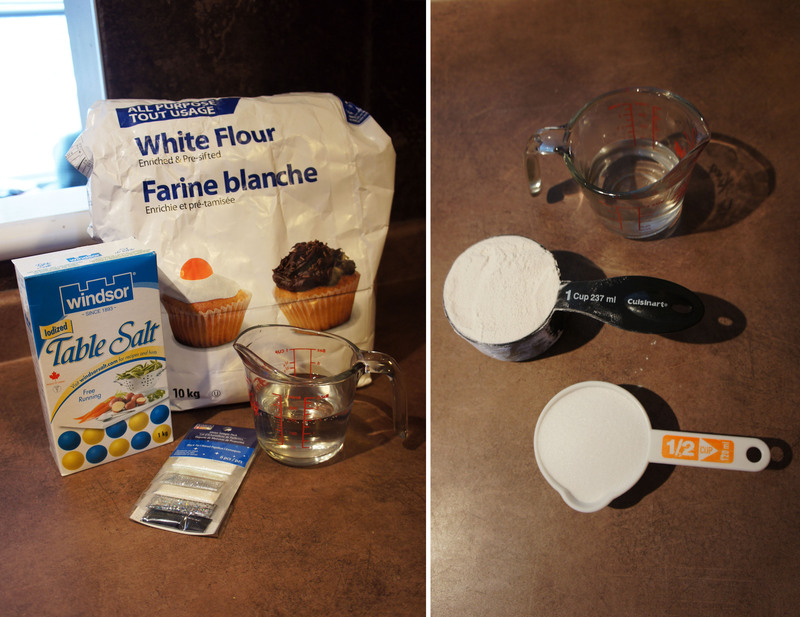 To make the dough, I just dumped all the ingredients into my stand mixer bowl and used the dough hook to combine. They came together fairly easy with a bit of hand kneading afterwards, but my dough was a little dry and I ended up having to add more water. 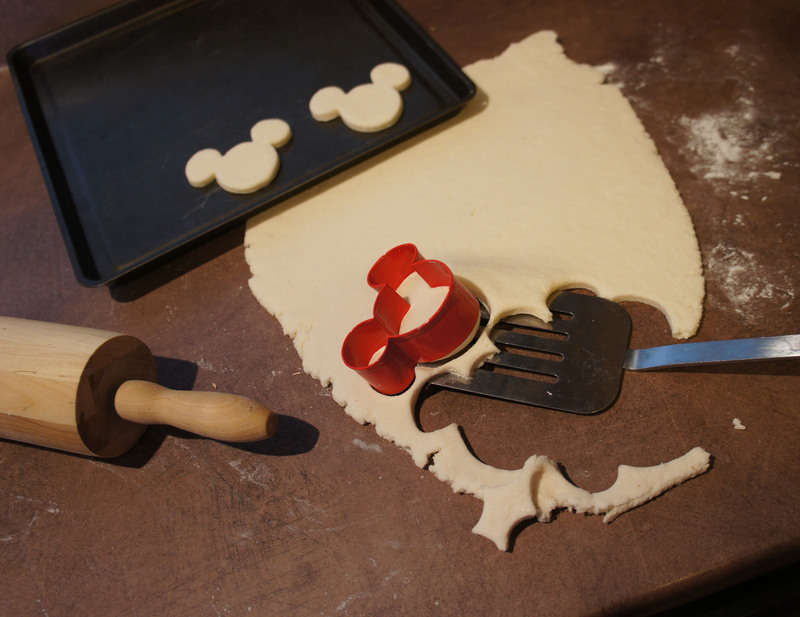 Once the dough was made, I simply rolled it out with a rolling pin, and used my cookie cutter to cut out my Mickey Shapes. I then transferred the cut shapes to a cut sheet using a metal spatula, just as you would making sugar cookies. For the ear hat portion, I used the same Mickey cutter and then used a circle cutter to cut off excess at the bottom. I decided to do them separately and not stick the two pieces of dough together at this point so painting the ears would be a little easier. For the small snowman noses, I free shaped them from bits of the dough. The final step with the dough was to put a hanging holes in each piece. I used a drinking straw and just poked through each head and set of ears to create a hole for my string to go through. Once happy with my cut shapes, I put both pans of ornaments into a 200 degree Fahrenheit oven and let them slowly dehydrate for 2 hours. 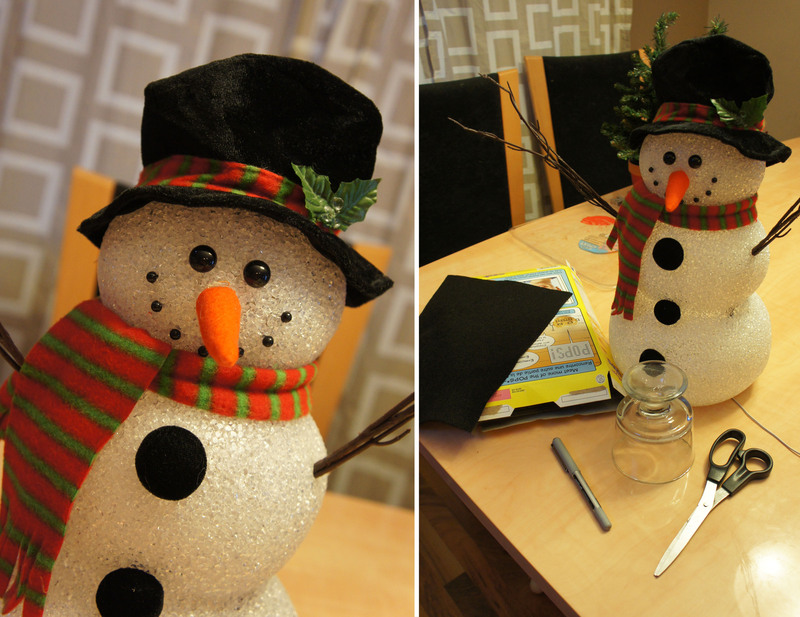 Once dried and cooled, my next step was to paint the ear and nose pieces using acrylic craft paint, and then assemble each of my snowmen using hot glue. Most of my string holes lined up pretty well when stacking the pieces, but I did put the strings through before gluing so I wasn’t struggling to feed them through afterwards. Finally, I drew on the mouth and eyes with a small sharpie pen. I also had some snowflake pieces I had cut out and baked so I gave those to my son and let him go to town on them with my sharpie markers while I was busy assembling my Mickey’s. This was my first attempt with salt dough and it was so easy it is something I will definitely try again. If I were to make these same ornaments again, I would make the ear pieces a bit thinner, but overall I love the way they turned out. They look cute on my tree and it was a very inexpensive project using ingredients and supplies I already had on hand.